At steady state, the perivascular niche contains different subsets of mesenchymal cells, depending on the vessel type and size. In the microvasculature, pericytes are embedded within the vascular basement membrane and are essential for vascular development and stability. The outer covering of larger vessels (the adventitia) contains adventitial mesenchymal cells in a collagenous matrix. Other mesenchymal subsets such as FAPs and MSCs are localized in close proximity to blood vessels. 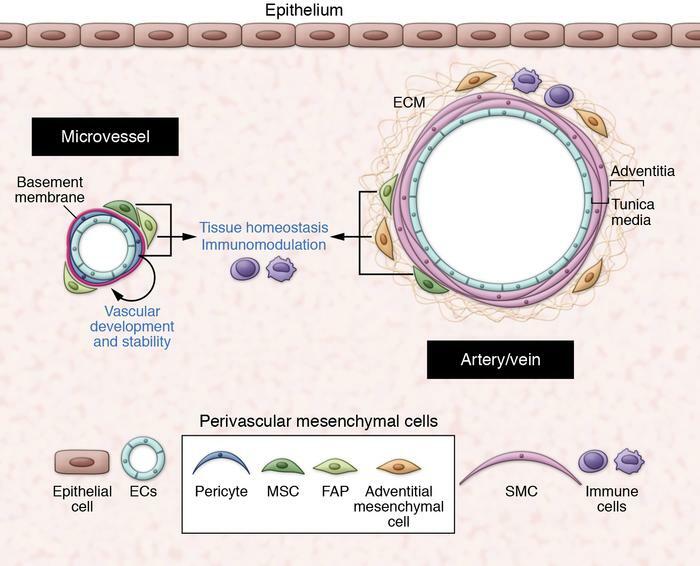 At steady state, perivascular mesenchymal cells have essential roles in maintenance of tissue homeostasis. SMC: smooth muscle cells.